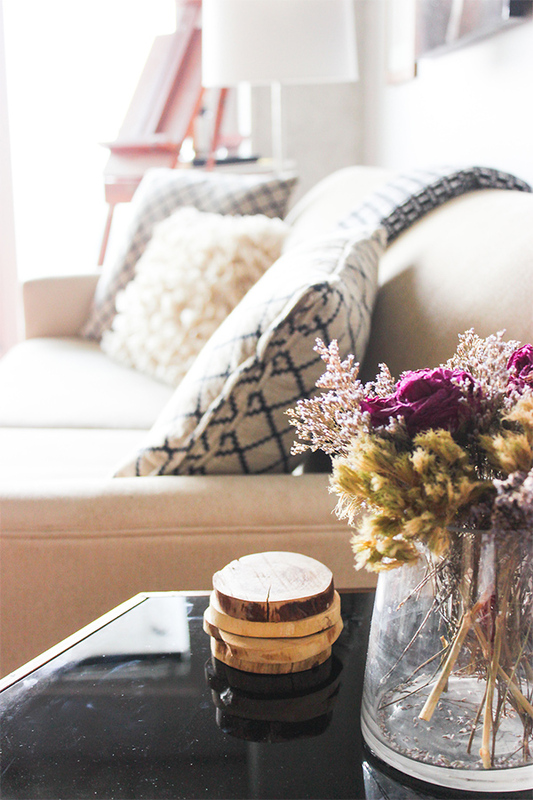 It’s been a few weeks since I’ve shared a home tour with you, so this edition of “Bloggers at Home” is right on time! 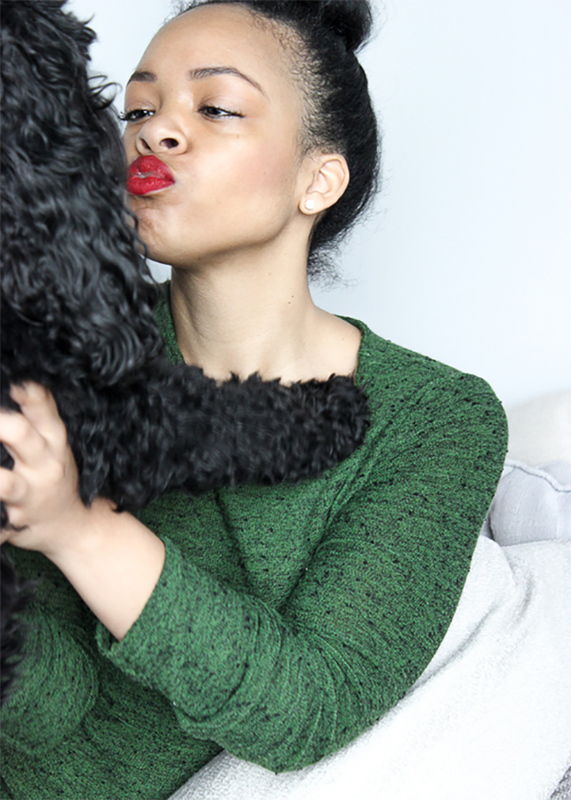 I’m getting to know lifestyle blogger Tiffany Jones of 726 sqft blog and she’s been kind enough to show us around her Atlanta home. Tiffany’s blog shares tips for creating an authentic and inspired life and today she’s sharing a glimpse into her own minimalist, inspired lifestyle. 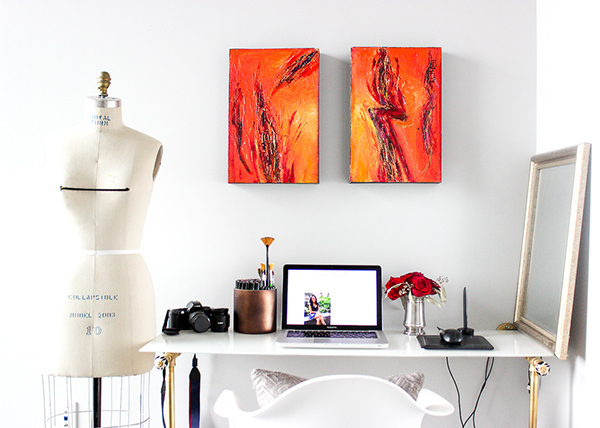 She even shares how she created her own DIY floating desk, which is fantastic! Read on for more. Thanks Tiffany! Jacquin: It’s so great to be chatting with you today! 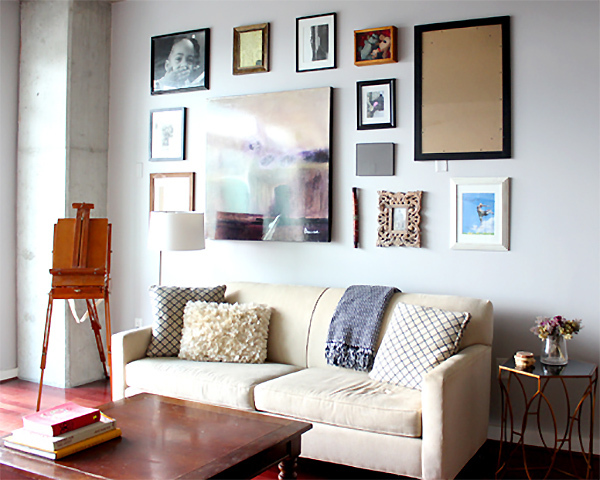 Can you share a little about your blog and your inspiration behind your blog 726 sqft? Tiffany: Hi! 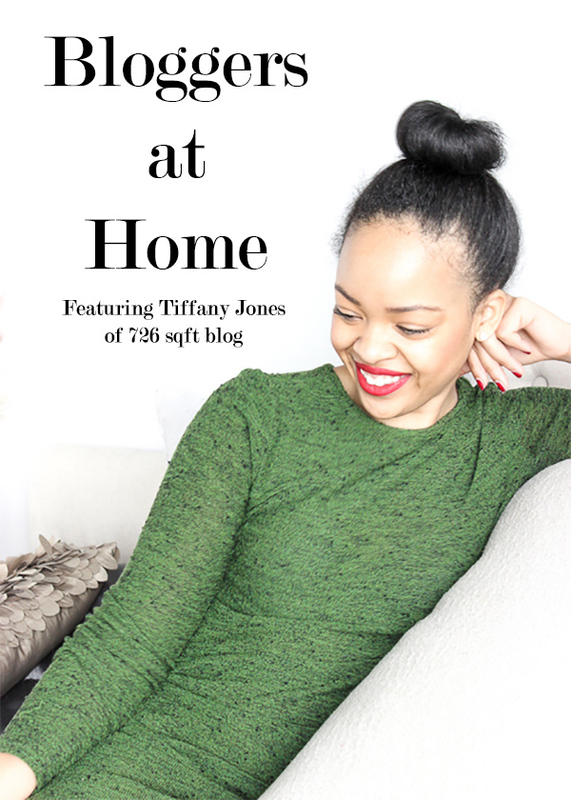 I’m Tiffany Jones, the artist, photographer, designer and blogger for 726 SQFT lifestyle blog and design studio. I’m originally from Richmond, VA, but I now call Atlanta, GA home. 726 SQFT is about being limitless in limited spaces, stepping outside of your comfort zone every now and then, and truly living the life you want no matter what. Do the things you love and you’ll make yourself a better you! 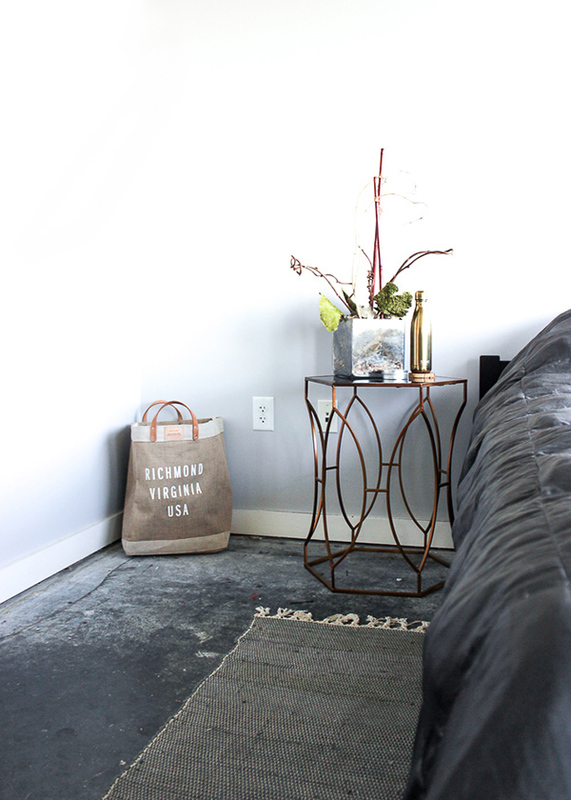 Tiffany’s DIY floating desk she made is a great space saver! See her floating desk tutorial here. Jacquin: Tell us about your personal style. 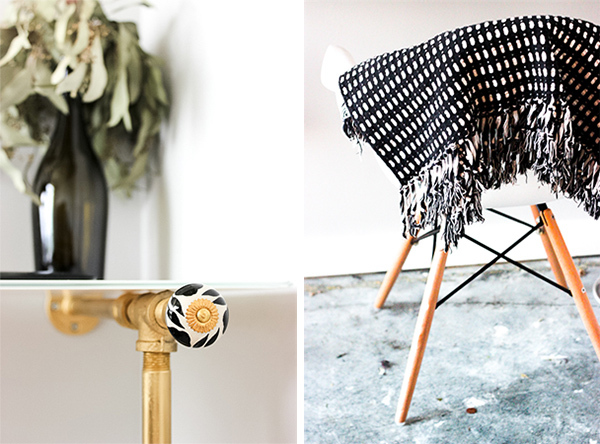 How is your personal style reflected in your home? Tiffany: Recently I’ve slowly started transitioning all parts of my life to a more minimalistic style. I’ve purged my entire home, clothes and some furniture to start over with a clean slate. I believe less is more and prefer simple, clean styles. Neutral palettes are my favorite and give me a calming feeling. Jacquin: Have you done any do-it yourself projects around your home that you’ve really been happy with? Tiffany: I made the desk in my bedroom! 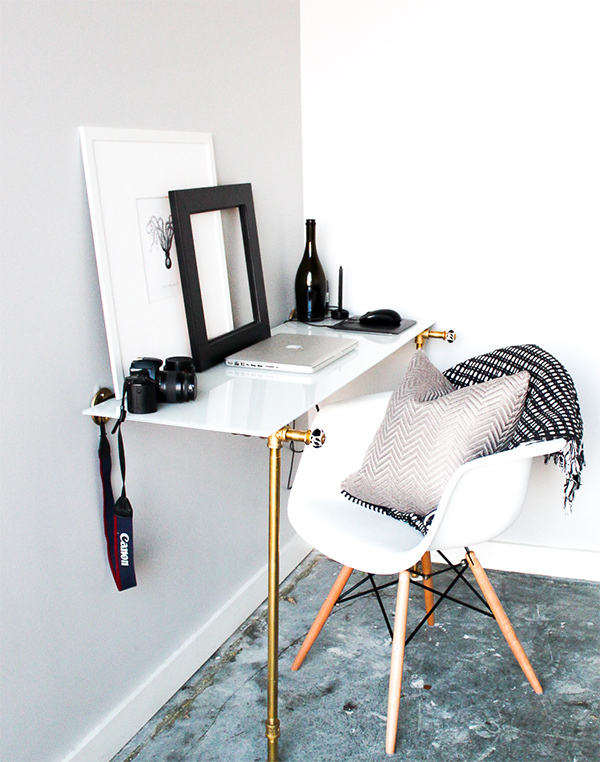 Living in a one bedroom condo requires a bit of creativity in terms of fitting in a desk. I also wanted to save money since desks are so expensive, so I went the do it yourself route. It’s been such a great solution because this floating desks only requires two legs and is attached to the wall. Perfect space saver! I made this floating desk from pipes, a glass top and drawer knobs. Check out the stylish doornob details in the photo of my desk below. 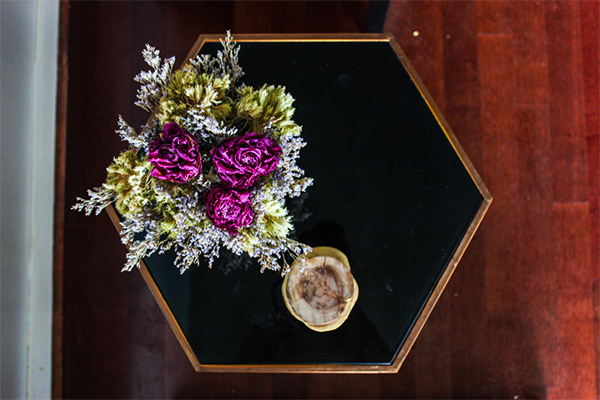 You can find the tutorial for my DIY floating desk on my blog here. Tiffany’s pet dog, Max. He looks so friendly! Jacquin: You have the cutest dog! What’s your favorite thing about your dog, Max? 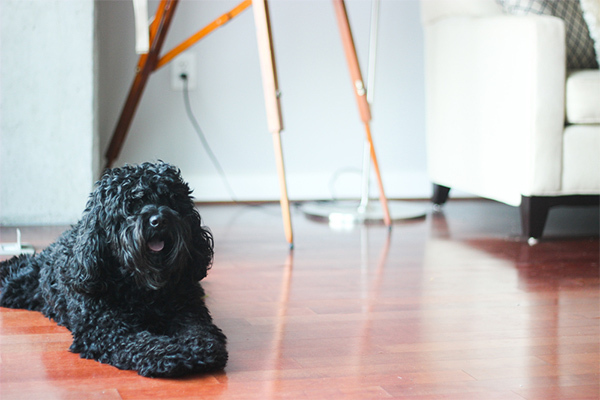 Have you made any adjustments for your home’s decor and furniture since having a dog? Any tips for people decorating as dog owners? end of the bed to keep the comforter clean. Tiffany: My bedroom! The most peaceful part of my day is relaxing in my bedroom with peace and quiet. I have an awesome view of the Atlanta Skyline and it’s a beautiful place to watch the sunrise and sunset. Jacquin: I saw that you’re growing a potted lemon tree from a seed at home currently. What a great idea! I know the smell will be amazing, if it isn’t already. How is your lemon plant doing? Any tips you’ve learned about growing a lemon tree plant since you’ve started? Tiffany: I’m winging it! I know absolutely nothing but to give it plenty of sun and water. It’s still very small, no lemons yet, I’m thinking it may take another year or so. Jacquin: Studying fashion design sounds so exciting! How has attending school for Fashion Design prepared you for what you’re doing today? Tiffany: I currently work for Spanx as a Technical Designer so my background in Fashion Design has helped me tremendously. I focus on the fit of the garment and pattern-making which is a huge part of what I learned in school. In terms of my own business I’ve learned to incorporate design into all aspects of my life from interior to personal style. It’s helped me to live a creative, inspired life. 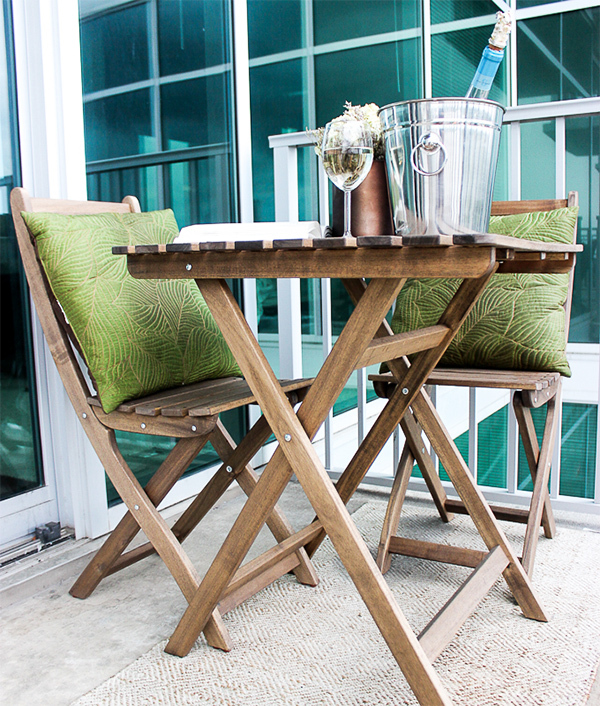 Tiffany’s relaxing balcony space at home. Tiffany: I recently stumbled across Carol Erb’s “Animal Intentions” collection and was completely inspired. I love the unexpected mix of interiors with nature and the animals. 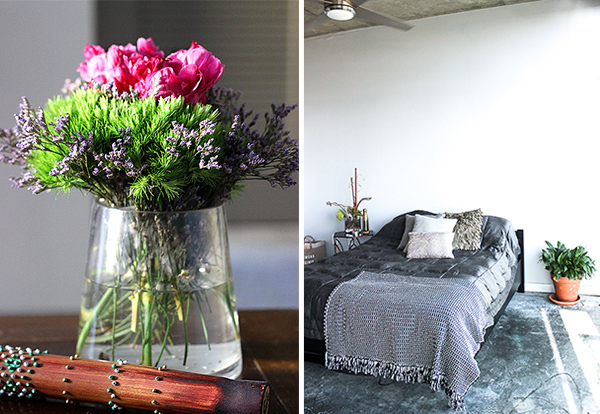 She sticks to a relatively neutral palette but incorporates small pops of color from nature. 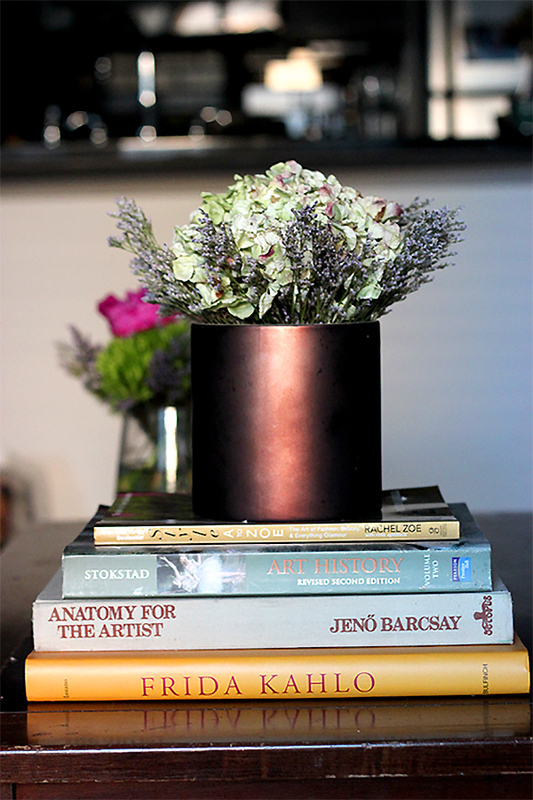 Nature’s beauty is always inspiring, especially when incorporated into the home. You can see her work here. Visit Tiffany’s lifestyle blog 726 sqft for chic fashion inspiration, recipes, and other great topics that I know you’ll love. You can also find Tiffany on Instagram here. Have a lovely week!